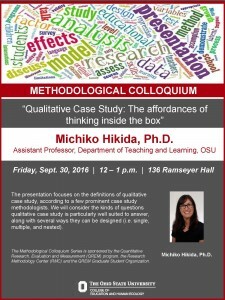 The EHE Research Methodology Center (RMC) is Proud to Present Penn State Distinguished Professor Dr. Linda Collins! 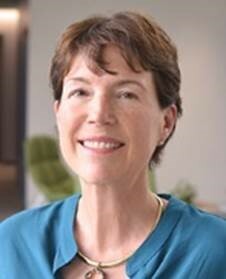 Featured Speaker: Linda Collins, Ph.D.
Director of The Methodology Center at Penn State, Distinguished Professor of Human Development and Family Studies (HDFS), and Professor of Statistics Linda Collins will present her groundbreaking work on adaptive designs and intervention optimization. Behavioral and biobehavioral interventions (BBIs) are used widely for prevention and treatment of health problems, and for promotion of well-being and academic achievement. BBIs are typically developed and evaluated using a treatment package approach, in which the intervention is assembled a priori and evaluated by means of a two-group randomized controlled trial (RCT). 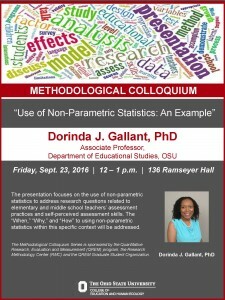 Dr. Collins will describe an alternative framework for developing, optimizing, and evaluating BBIs. This framework, called the multiphase optimization strategy (MOST), is a principled approach that has been inspired by ideas from engineering. Dr. Collins proposes that MOST offers more rapid long-run improvement of the effectiveness, efficiency, economy, and scalability of BBIs, without requiring a dramatic increase in research resources. 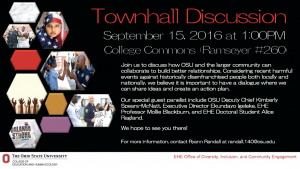 To subscribe/unsubscribe, please contact Sandra Reed at reed.665@osu.edu. Eligible undergraduate students must be declared as a major or minor in American Indian Studies, Asian American Studies, Disability Studies, Latina/o Studies, or Sexuality Studies. Graduate students must be enrolled in the GIS in Disability Studies, Latina/o Studies, or Sexuality Studies and/or delivering a paper or doing research on a topic relevant to American Indian Studies, Asian American Studies, Disability Studies, and/or Sexuality Studies. 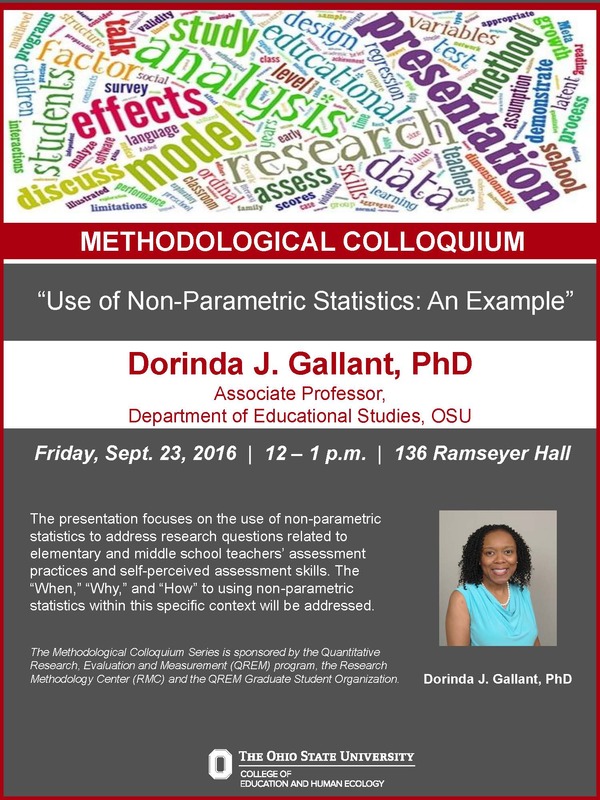 TOMORROW 9/23 Methodological Colloquium with Dr. Gallant! Paula Chambers, founder and CEO of the Versatile PhD, will present two interactive workshops on October 4, both focused on alternative careers for PhDs. 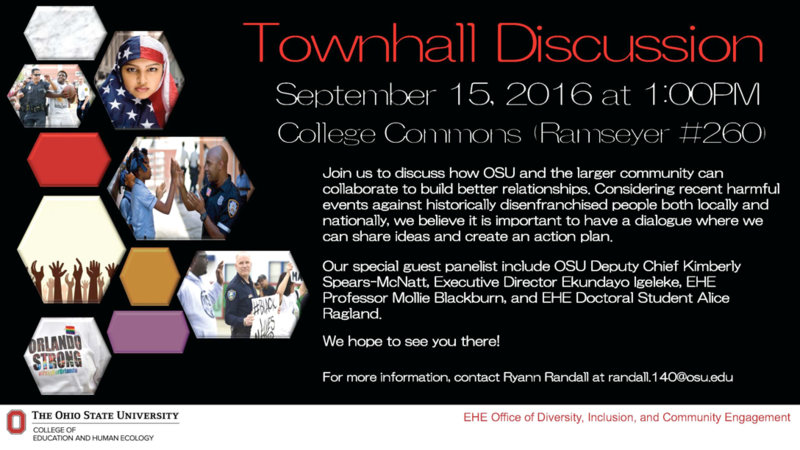 The event is free and open to all, but space is limited. Program Director Position Available! Apply Now! 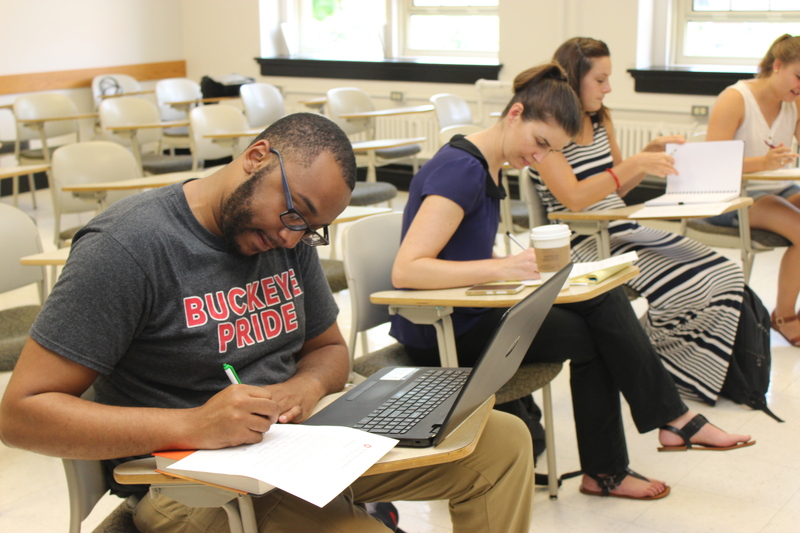 Program Director Position Open at the Ohio Education Research Center (OERC) and the Ohio Longitudinal Data Archive (OLDA). See a basic description below. For the complete job posting see: https://www.jobsatosu.com/postings/72931. The Ohio Education Research Center (OERC) & Ohio Longitudinal Data Archive (OLDA) at The Ohio State University within The John Glenn College of Public Affairs and the Center for Human Resource Research in the College of Arts and Sciences seeks a Director of Operations to provide a broad range of outreach & engagement, research and operations administration. The OERC & OLDA Operations Director oversees the day to day services, functions, and employees of the centers, with a particular focus on external operations. This position serves as the principal agent in charge of maintaining and growing relationships. The OERC & OLDA Operations Director is expected to oversee the centers’ relationships with funding entities such as the Ohio Department of Job and Family Services or the Ohio Department of Education and manage these relationships with state and local government by working closely with communications and research officers that hold our contracts. This position oversees center communications, guides and facilitates the processes to negotiate terms and conditions as well as scopes of work for projects with state and federal authorities (in collaboration with Office of Legal Affairs and Office of Sponsored Programs), and serves on several critical governance committees that are staffed by state and university staff/faculty. She or he also provides presentations at and acts as a representative of the OLDA and OERC at federal, state and local meetings. This position is also responsible for writing and submitting grant proposals and generating grant reports for awarded projects and contracts. This position will be located in The John Glenn College of Public Affairs in Page Hall on OSU’s main campus. This person will report to the OERC & OLDA Director and have regular working hours of Monday-Friday from 8:00 am-5:00pm. Working hours may be adjusted during times of high activity in the centers and/or for special events. Some travel to research sites within the state of Ohio will be required. This position is grant funded and contingent upon continued funding availability. 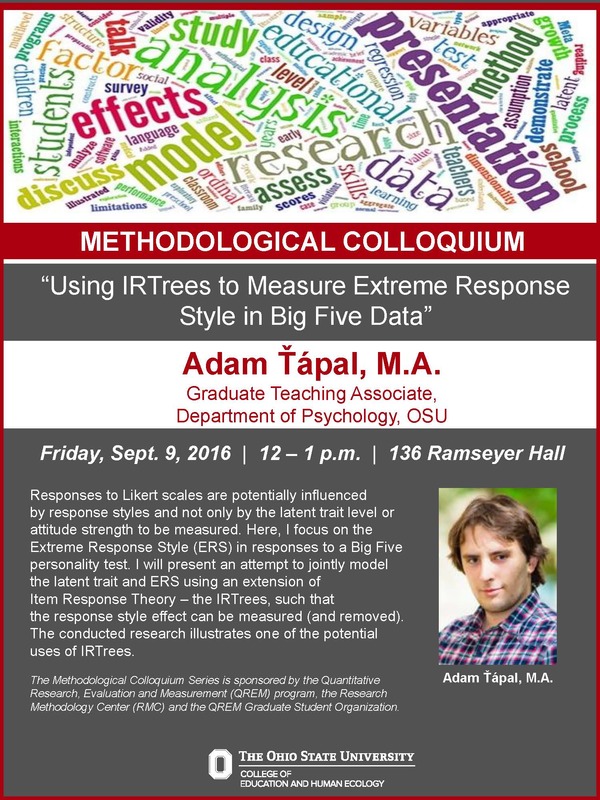 The Undergraduate Research Office and University Libraries’ 10th Annual Fall Undergraduate Research Student Poster Forum, will be held on Thursday, September 15, 2016, in the Buckeye Reading Room at Thompson Library. This is not a judged forum with awards, but provides an opportunity for student presenters to showcase their summer research as well as gain valuable presentation experience. Graduate and professional students from all disciplines are needed to provide reviews of 2-3 posters. Students are eager to receive formal feedback about their posters and oral presentations and discuss their research with others. This could be a great mentoring experience for you as well! 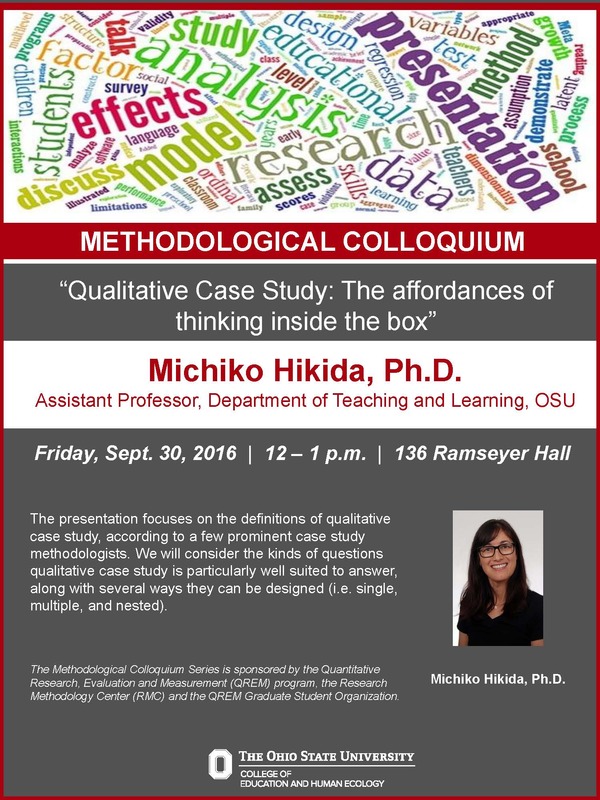 Students from a variety of disciplines will be presenting their work during each session. Please choose the session that is most convenient for your schedule. We encourage you to volunteer for as many sessions that your schedule will allow. If you are available to volunteer, please complete the online form by Wednesday, September 7. Our office will contact you at a later date with your assigned projects. 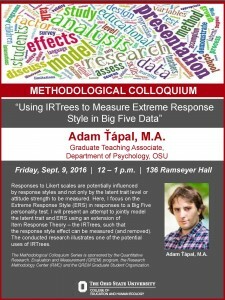 Feel free to contact Amanda Perrin at perrin.42@osu.edu if you have any questions.